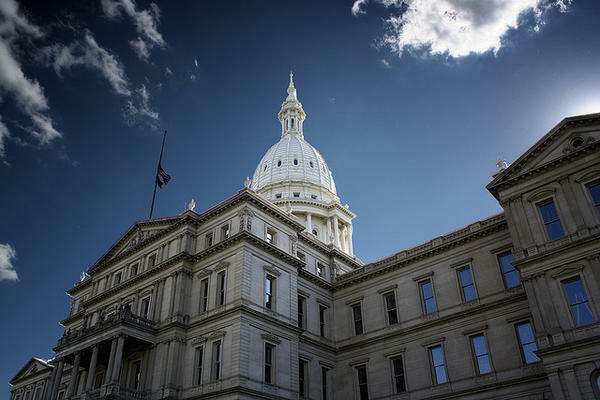 On Wednesday, the Michigan Legislature moved to roll back previously-passed legislation increasing the state's minimum wage and mandating paid sick leave. Nearly 400,000 Michigan voters signed petitions to get a proposal on the November ballot to increase the state’s minimum wage and provide paid sick leave. But Republicans in the Michigan Legislature adopted those measures into law instead, side-stepping the need for a proposal. Today, state lawmakers moved to scale back those laws. Michigan Radio’s Cheyna Roth tells us more about this developing story. Mackinac Bridge Authority member: Line 5 tunnel plan "ill-conceived and clandestinely implemented"
Today, a State Senate committee approved a bill that would give the Mackinac Bridge Authority oversight over a potential utility tunnel intended to house pipes replacing Enbridge’s Line 5 pipelines. Barbara Brown, a board member of the Mackinac Bridge Authority, tells us why she does not believe that her organization should be responsible for the proposed tunnel. Stateside reached out to Governor Snyder's office for comment on its communication with the Mackinac Bridge Authority. We did not get an immediate response. Anthony Collings is the director of the new film Lourdes, a documentary that follows the story of Lourdes Salazar Bautista, a Michigan resident and mother of three who was deported to Mexico in 2017. Collings joined Stateside to talk about why he wanted to share Lourdes’ story, and what he hopes viewers will take away from watching the film. Collings will be screening Lourdes at the Ann Arbor Downtown Library at 6:30PM on Thursday, November 28. You can learn more about Lourdes here and watch it on YouTube. Matinga Ragatz is Michigan Radio’s education commentator. She shares her thoughts on the modern teacher-parent relationship, how that dynamic has changed over time, and what both parents and educators could do to better engage with one another. David Van Wie produced and directed Detroit Under S.T R.E.S.S., a documentary that focuses on a Detroit police decoy called “Stop the Robberies, Enjoy Safe Streets” that operated from 1971 to 1974. He tells us more about this controversial chapter in Detroit history and the many dark, violent stories that came out of the S.T.R.E.S.S years. This interview originally aired on August 22, 2018.